The claims representatives in your company access a corporate Web site and and update customer claims. 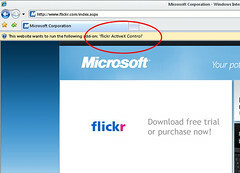 The Web site uses several unsigned ActiveX controls to enhance user experience. The Web server is located behind a firewall. A claims representative cannot use the site because he is unable to download ActiveX controls. No other users are experiencing the problem. The Local Intranet zone should be configured to allow unsigned ActiveX controls to be downloaded and run. By default, the Local Intranet zone in configured to disable the downloading and running of unsigned ActiveX controls.